H G Wells, you’ll recall, conjectured on the world-in-the-making from 1933 until the year 2106 in his famous science fiction, The Shape of Things to Come. Some of his predictions turned out to be dead right (like the outbreak of the Second World War) while some others were wildly off the mark (like the failure of Roosevelt’s New Deal.) However, if someone, today, attempts to speculate on the world as it would be, say, by mid-twenty-first century, he will be on safe wicket if he pictures China as the world’s largest country, controlling half the globe, whose rulers visit Beijing every year on the occasion of the Chinese New Year to kowtow to the President of the People’s Republic of China. The Communist leaders of China have always reiterated the stand of Comrade Mao Zedong that other countries were in occupation of the Chinese territory which they usurped at the close of the Qing dynasty. The Empire of the Great Qing or Manchu dynasty was the last imperial dynasty of China that ruled the country from 1644 to 1912 with a brief, abortive restoration in 1917. It was preceded by the Ming dynasty and succeeded by the Republic of China. The Qing multi-cultural empire lasted almost three centuries and formed the territorial base for the modern Chinese state. “We should firmly uphold China’s territorial sovereignty, maritime rights and interests and national unity, and properly handle territorial and island disputes,” President Xi Jinping reiterated lately before the central conference of the ruling Communist Party of China (CPC) on work relating to foreign affairs. 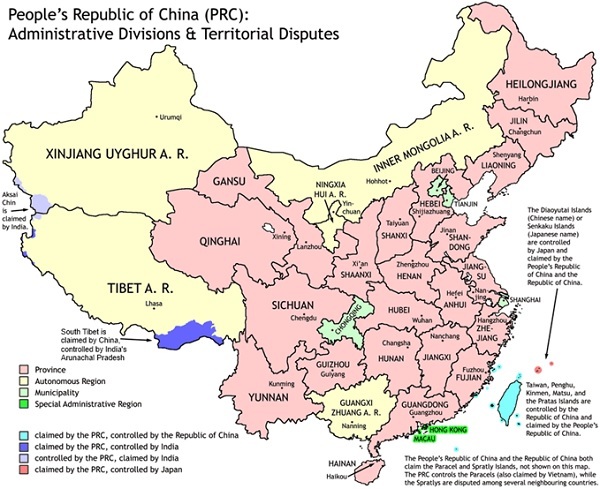 And here is the list of areas that, according to the Chinese, were lost due to the fall of the Qing empire: Burma, Laos, Northern India, Vietnam, Nepal, Bhutan, Thailand, Malaysia, Singapore, the Ryukyu Islands, 300 islands around China, as well as Kyrgyzstan, Mongolia, Taiwan, South Kazakhstan, and the Afghan province of Bahdashan. Wait for a few years and the list might as well include Tasmania in Australian continent and parts of Hawaii in the Pacific and Alaska in North America! Incidentally, all of these countries and regions combined exceed the territory of modern China. Not all complaints are voiced by the Government of China in the international arena, but within the country the imperialist ambitions have not been lost, but rather, are actively promoted. China has its border in common with fourteen countries. Except Russia, with which its border was settled after a bloody armed confrontations in the 1960’s, there are extravagant Chinese territorial claims against all of them. In terms of land mass, Russia, today, is ranked as the first among all the countries, followed by Canada, China and the United States. (India ranks seventh after, Brazil and Australia,) If the Chinese claims are sustainable, China indeed will be the top of the table, surpassing Russia. And that’s what the PLA aims at. As it is, China continues to be in physical occupation of large areas of Indian territory. On the Aksai Chin plateau in Ladakh, China is in physical possession of approximately 38,000 sq km of Indian territory since the mid-1950s. In addition, Pakistan illegally ceded 5,180 sq km of territory in the Gilgit-Baltistan area of Jammu and Kashmir to China in1963 in the Shaksgam Valley, north of the Siachen Glacier, under a bilateral boundary agreement that India does not recognize. Through part of this area China built the Karakoram highway that now provides a strategic land link between Xingjian, Tibet and Pakistan. China continues to stake its claim to about 96,000 sq km of Indian territory in Arunachal Pradesh, which it calls Southern Tibet. Chinese interlocutors have repeatedly claimed that the Tawang Tract, in particular, is part of Tibet and that the merger of this area with Tibet is non-negotiable. China’s official position is that the reunification of Chinese territories is a sacred duty for the PLA. And that’s not all. The present Chinese leadership is equally vociferous in its maritime claims. What modern atlases call the South China Sea received its English-language appellation, and its coordinates, under a 1953 document entitled Limits of Oceans and Seas published by the Monaco-based International Hydrographic Organization, whose patron is Prince Albert. And it’s critical to the global economy. It carries more than half of the world’s seaborne trade; connects the fast growing economies of the Asian Pacific with markets in Europe, the Middle East and Africa, and, most importantly, is reckoned to cover vast oil reserves. Yet, in a push that’s creating alarm among China’s neighbors – and the U.S. – the inheritors of the Manchu empire who now run China are making increasingly assertive claims to almost all of it as part of an ancient imperium that they are proudly reviving. The Philippines filed the first-ever legal challenge to the line as part of a 4,000-page submission to a U.N. arbitration tribunal in The Hague. It wants the line declared as without legal weight so that it can exploit the offshore energy and fishery resources within its U.N.-declared exclusive economic zone. China has so far abstained from the proceedings. The landmark case risks a Chinese backlash. Already, Beijing has all but frozen political ties with Manila. In recent days, Chinese ships have been playing cat-and-mouse games with Philippine vessels trying to re-provision marines stuck on a lonely outpost called the Second Thomas Shoal. But what has given the case even greater significance – and a potential for escalation to a strategic level – is that the U.S. has joined in attacks of the nine-dash line, dropping its previous diplomatic caution. 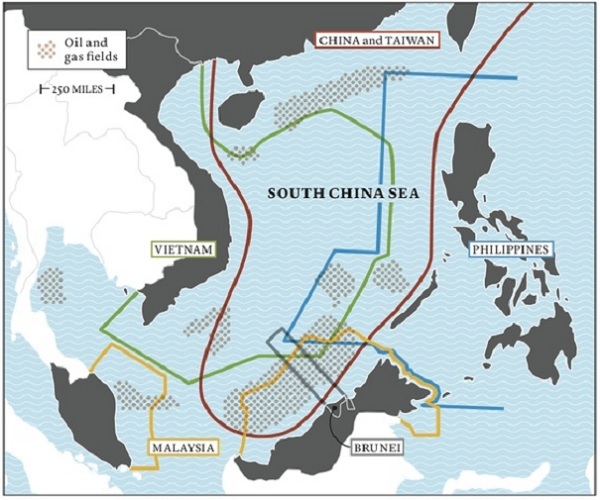 The South China Sea has thus become home to many overlapping claims of maritime rights, as shown on the map above. Since 2009, China has asserted exclusive rights to more than 80 percent of the sea, enclosed by a line (in red) sometimes called the cow’s tongue. The line has no international standing. Resource scarcity has added a maritime dimension to the Sino-Indian geopolitical rivalry. As China’s and India’s energy dependence on the Middle East increases, both are actively seeking to forge closer defense and security ties with resource supplier nations (e.g., Saudi Arabia and Iran), and to develop appropriate naval capabilities to dominate the sea lanes through which the bulk of their commerce flows. Since seventy-seven percent of China’s oil comes from the Middle East and Africa, Beijing has increased its activities in the Indian Ocean region by investing in the economies of littoral statesby building ports and infrastructure, providing weaponry, and acquiring energy resources. For instance, nearly ninety percent of Chinese arms sales go to countries located in the Indian Ocean region. Understandably, Beijing is investing heavily in developing the Gwadar deep-sea port in Baluchistan province of Pakistan, and naval bases in Sri Lanka, Bangladesh, and Myanmar. Whether one calls it a “string of pearls” or a series of places at which China’s navy can have bases in strategic locations along the same sea lanes of communication that could neutralize India’s geographical advantage in the Indian Ocean region. New Delhi too is pursuing the same strategy as Beijing. It is creating its own web of relationships with the littoral states, both bilaterally and multilaterally, through the Indian Ocean Naval Symposium, to ensure that if the military need arises, the necessary support infrastructure and network will be in place. India has also stepped up defense cooperation with Oman and Israel in the west, while upgrading military ties with the Maldives, Madagascar, and Myanmar in the Indian Ocean, and with Singapore, Indonesia, Thailand, Vietnam, Taiwan, the Philippines, Australia, Japan, and the United States in the east. In short, maritime competition is intensifying as Indian and Chinese navies show the flag in the Pacific and Indian oceans with greater frequency. This rivalry could spill into the open after a couple of decades, when one Indian aircraft carrier will be deployed in the Pacific Ocean and one Chinese aircraft carrier in the Indian Ocean – – ostensibly to safeguard their respective trade and energy routes. China’s ‘Oliver Twist will ask for more’ appetite for more and more territories is all too evident. China’s foreign policy toward its Asian neighbors has now morphed from such slogans as: “Keep our heads down, and bide our time” to the overtly nationalistic, even truculent. To have alienated Japan, the Philippines, Vietnam, Malaysia, and Borneo so thoroughly, after having spent so much capital winning their hearts and minds with benevolent soft power efforts, is quite a dramatic turn-around in policy. What’s the reason for this? In all likelihood leaders in China have been tempted to turn to nationalism as a binding agent for domestic dissension. And, since these islands raise the always emotional issue of national sovereignty, they do provide a convenient way to outsource targets of people’s more immediate concern, especially at a time when grievances on the home front – from the growing corruption, stifling pollution, inequality, infringements of peoples’ rights, and land confiscations – are rapidly mounting. 'China's bid to redefine world order' is an intention of right action. It has to be if it is to be sustainable of life, China's life. Life is identified with the principle of right action or rightness, our every step is guided by this; therefore China has to make a case for the rightness of its intention, hence the argument from history to make territorial claims. It is a fine distinction between the power to act and the right to act, which if lost, the power to act becomes the right to act. This is the story of empire, also of crime. China has in modern times lost the distinction in the annexation of Tibet, which in fact has become a precedent of right action in its eyes. It is not simply a case of ' can I have some more?' - but a burning life instinct for rightness of action that China's power validates to itself.